It's Skye time! Is she ready? The Paw Patrol is sure to have an important mission coming, and they're going to need all the top pups around to join the team. And of course, that means they're going to need one brave little cockapoo pup! If your girl is ready to join the team, just suit her up in this Nickelodeon officially licensed costume! Straight from the enormously popular children's show this Paw Patrol costume for girls has all the signature character details brought to life in a vibrant and fun way. Skye's main duties on the show are to watch over emergencies from the air in her helicopter, and to use the copter's grappling hook to help save people who are in danger! 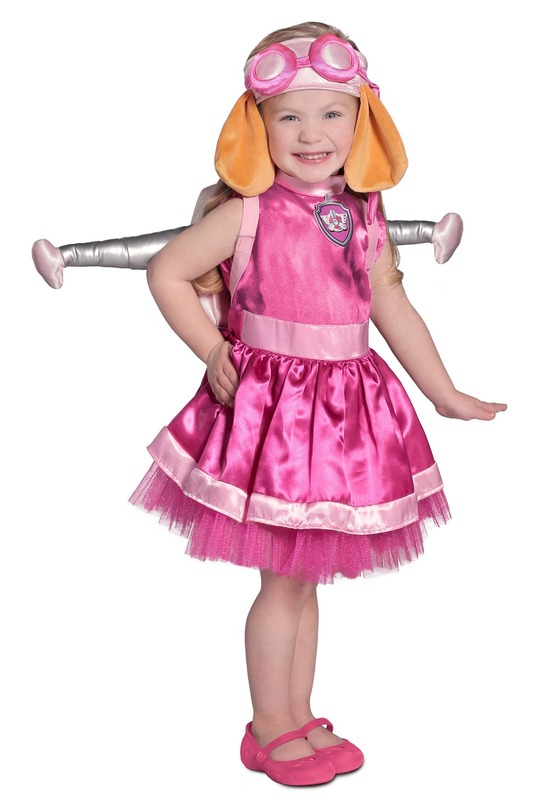 If that sounds like a mission suited for your child, then the details on this costume will make her feel like she's transformed into the canine character. The costume dress has lovely satin and glitter tulle accents, and features an attached character badge for a touch of authenticity. Just strap the action backpack on her back with the shoulder straps, and complete the look with the included headpiece. It features Skye's goggles and her signature floppy cockapoo ears, so she'll have the look down pat. Even if you think she might be a little on the small side to be piloting a rescue helicopter, there's no reason not to get her started thinking about saving the day with this fun costume!